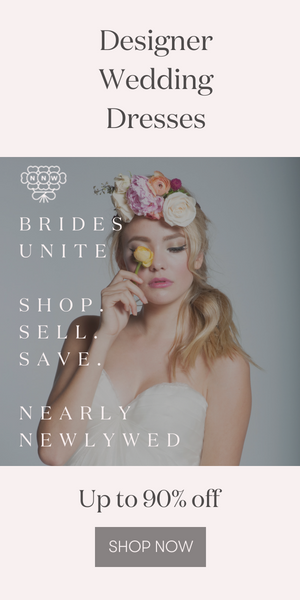 To enter to win this beautiful wedding accessory, just leave us a comment here letting us know about which of the pieces that The Aisle has on sale now are your favorites. You can see a few items from their current sales below, as well as on their website if you’ve signed up to be a member. (If you haven’t yet, what are you waiting for)!? We’ll accept entries all week long and randomly choose our winner next Monday, August 1, 2011. Good luck everyone! And happy online window shopping! The bracelets are ah-mazing! My favorite (other than the one that is being given away) is Ranjana Khan embroidered fan cuff. So gorgeous! Good luck to everyone, but I hope I win!!!! I really like that crystal mosaic cuff by Ranjana Khan! I love, love, love both cuff bracelets! My favorites for sure! I love the Ranjana Kahn vintage flower wedding veil. My daughter is getting married in April 2012 and she is making her own gown. This veil would compliment it perfectly. This was a tough one as I love Jenny Pakham, but my hands-down favorite were the Oscar de la Renta chandelier crystal earrings. Stunning without being over the top! I absolutely love Ranjana Khan cuffs! The embroidered one totally rocks! I think the Suzanna Dai Monte Carlo headband is gorgeous! I love the Elizabeth Fillmore Sabine short wedding dress. It would be perfect for my summertime reception! next August 11th! Love the Crystal Mosaic Cuff! Its all gorgeous but I really love the suzanna headband! I need the Ranjana Khan embroidered fan cuff and crystal mosaic cuff…so chic! Love-ING the rose quartz cuff….then again, who wouldn’t love them all!? Love the drama of the Emily & Ashley floral bridal necklace! It would be a nice addition for my wedding day attire! I love the suzanna dai headband in the 5th row! omg…i’m in love with the Rose Quartz Earrings….A…mazing! I’ve already placed them in my cart! I definitely adore the Tia Mazza Moonlight veil! Stunning, classy, perfect. Hello, Oscar de la Renta Enamel Floral Earrings. My, are you lovely! I also think the crystal embroidery on the Angel Sanchez Crystal Overlay Gown is just gorgeous. I LOVE, LOVE, LOVE the Ranjana Khan embroidered fan cuff! The crystal mosaic cuff is to die for!!! I know just the outfit I would wear it with, dressing up a casual look for sure!! Sooooo pretty. I don’t normally wear bracelets, but I think these Ranjana Khan pieces are amazing! I am in awe by the Crystal Lattice Bracelet in the giveaway and am equally in love with Ranjana Khan embroidered fan cuff. The bracelets are timeless, elegant, feminine and show-stopping! A think a bracelet is my new must-have accessory for my wedding day! I love the crystal mosaic cuff by Ranjana Khan – it’s stunning! Love all things Ranjana Khan, but fell in love with the vintage veil before I even knew it was hers. Wow! I really like the bracelet! I would also wear the strands of pearls with the teal ribbon – gorgeous! Any of the bracelets are gorgeous!!! I love the Subversive necklace with the pearls and ribbon. I think it’d be a great piece o wear on my wedding day and also a necklace I could wear again. It’s quite beautiful! It will rock on my wrist!!! I looove those Oscar de la Renta Enamel Floral Earrings. Just stunning! The Subversive Jewelry midnight blue pearl and ribbon necklace IS ABSOLUTELY AWESOME! I can picture that dressing up any outfit! (oh, and a lot of grubby sisters’s hands trying to steal it from me) ha ha. I love the mosaic cuff! I have stared at the Deco Princess Necklace by Ranja Khan for quite some time. It’s almost a good thing that it’s sold out! I can stop pining for it! The bracelet is GORGEOUS! I would love to wear it on my wedding day! The pearl necklace with the gorgeous midnight blue ribbon tie is to die for. Its a fantastic mix of traditional, whimsy and chic all in one piece. Not only would it be perfect with my gown on my wedding day but it would also with so many “everyday outfits” as well – a true classic! I love the Tia Mazza Moonlight veil!! I absolutely LOOOOOOVE the Ranjana Khan embroidered fan cuff! Just gorgeous! I love the vintage flower veil! I love Ranjana Khan cuffs. I love the Aisle! Already bought my dress from them. I really like the beautiful Christina Garcia Bergama comb. The Ranjana Khan bracelet would go perfectly with my new dress. They’re all so beautiful, how can you choose!? I LOVE all the necklaces, and although I wouldn’t wear one, I think the birdcage veils are unique and beautiful. I Love the Tia Mazza Moonlight veil, it’s vintage looking and delicate and just perfect! My favorite is the crystal mosaic cuff….although it is very hard to choose the favorite! I LOVE the Midnight Blue Pearl and Ribbon Necklace by Subversive Jewelry! It could definately be my “something blue”!! !